I'm not a guy that is into military strategy and tactics. Reading about that sort of thing ranks right up there with watching people play chess for me. However, if I'm serious about doing a believable first person interpretation of an early 19th century sailor I must know about the naval military history that occurred during my persona's lifetime. It would have been discussed over and over during messes and long watches. 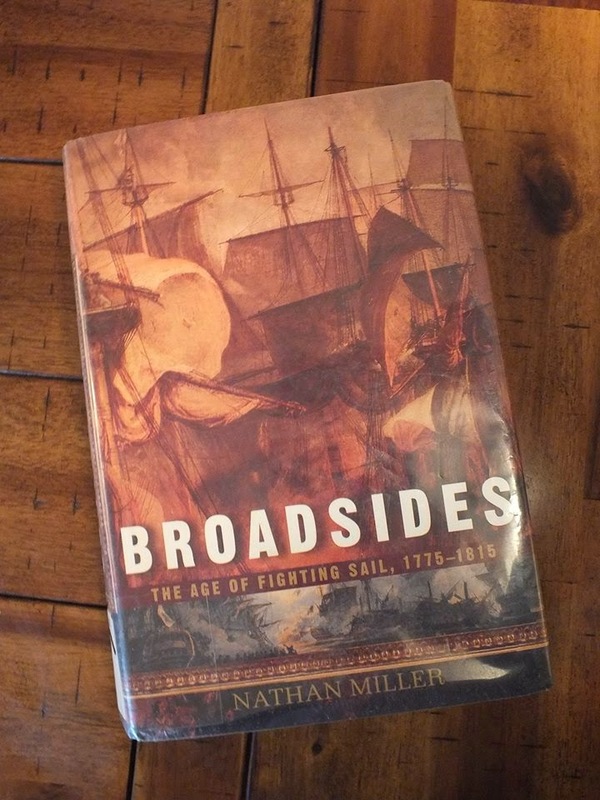 That's where Broadsides comes in as a good book for me. The book covers the period just before and through the time of the Acasta. It presents naval military history from a completely Anglo centric point of view, the French and Spanish only appear as antagonists. The book covers the structure and all the major engagements of the British Navy as well as the development of the American Navy and all its major engagements. Most importantly for me Miller does not get bogged down in too much strategic detail, his presentation is more that of a historian and less of a tactician. The book does suffer from a lack of maps. Miller makes lots of reference to locations and routes, he seems to assume his reader is completely familiar with the coast of both sides of the Atlantic. There are a few very basic maps in the back of the book, I only noticed them after I'd finished the book because they are not referenced in the text. If a guy was intent on doing a British naval impression but only intended to read two books I'd recommend "Jack Tar" for the daily life of a tar and "Broadsides" for the historic background. Jack Tar is an awesome book. I'd also recommend Steering to Glory, by Nicholas Blake - a day in the life of a ship of the line, going through the whole twenty-four hours of the day watch by watch and telling you what's going on on the quarterdeck, in the wardroom, on the weather-deck and below decks. Everything's based on actual documented occurrences.